Need dinner to get dinner on the table fast? 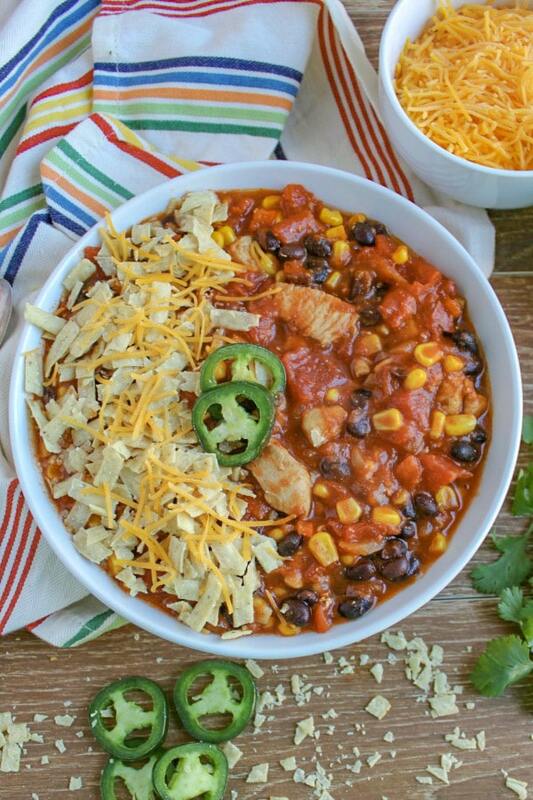 This Chicken Taco Soup is the perfect solution! Packed full of chicken, vegetables and taco flavor this family loved soup can be ready 30 minutes from beginning to end. My husband loves soup. He especially loves homemade soup. So you can imagine my surprise when I realized I’d never shared a soup recipe with y’all. That was until today. Now when I say this recipe is easy; I mean that if you can work a can opener then you’ve pretty much mastered this recipe. That’s simple enough right? 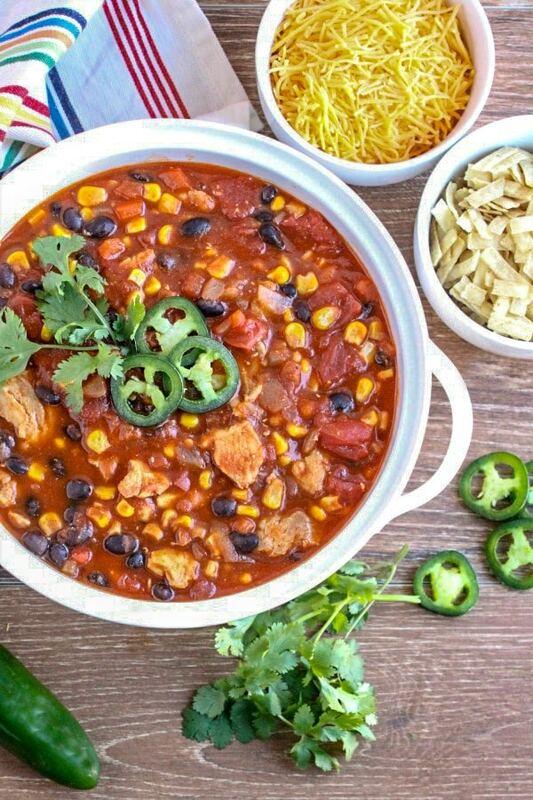 How do you make Chicken Taco Soup? Begin, by mining a red bell pepper, an onion and three cloves garlic. After, you’ve chopped the vegetables add them to a large pot of warm olive oil. Then cook for about three minutes or until they are tender and the onion becomes translucent. Next, add chicken broth, diced tomatoes, tomato sauce, taco seasoning, red pepper flakes, salt and pepper to the pot then stir well. Allow the liquids and seasonings simmer together for five minutes. Finally, add black beans and corn to pot and bring to a soft boil. Turn heat to low cover and cook for 15 minutes. This recipe calls for finely diced a red bell pepper, onion and garlic. If you are in a hurry you can use a food processor to chop up the bell pepper and onion. Another time saver is to buy frozen, pre-cut onion and bell pepper in the freezer section of the grocery store. If you do this then there’s no need to thaw the onion and bell pepper first just measure and add them to pan. 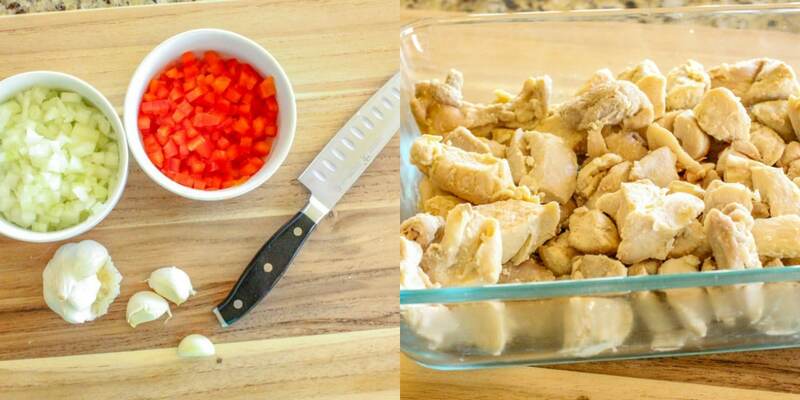 This recipe does require cooked chicken. I used two boneless skinless chicken breasts. However, a rotisserie chicken from your grocery store is another quick and easy option. Once you’ve topped off your soup you’re ready to enjoy it. Looking for more soup recipes you’ll love? 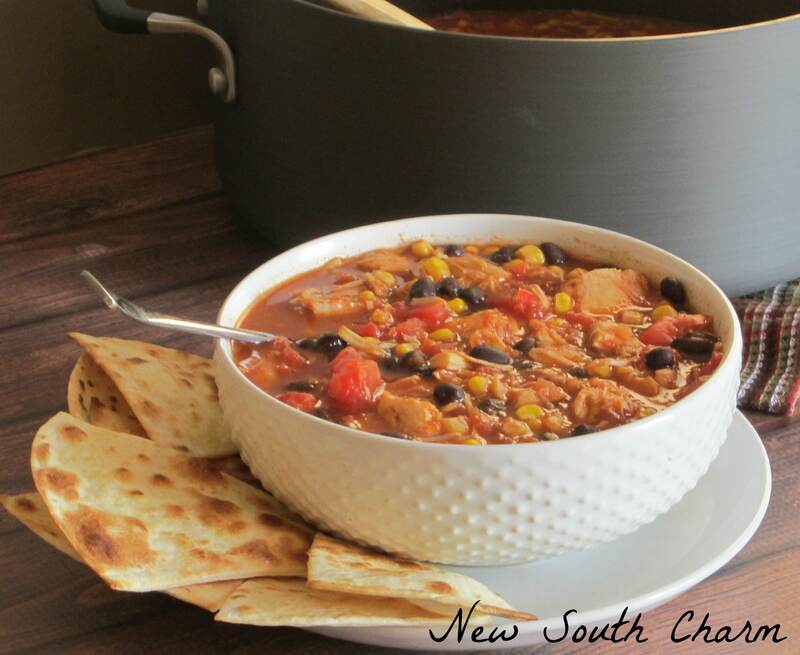 Packed full of chicken, vegetables and taco flavor this family loved soup can be ready 30 minutes from beginning to end. 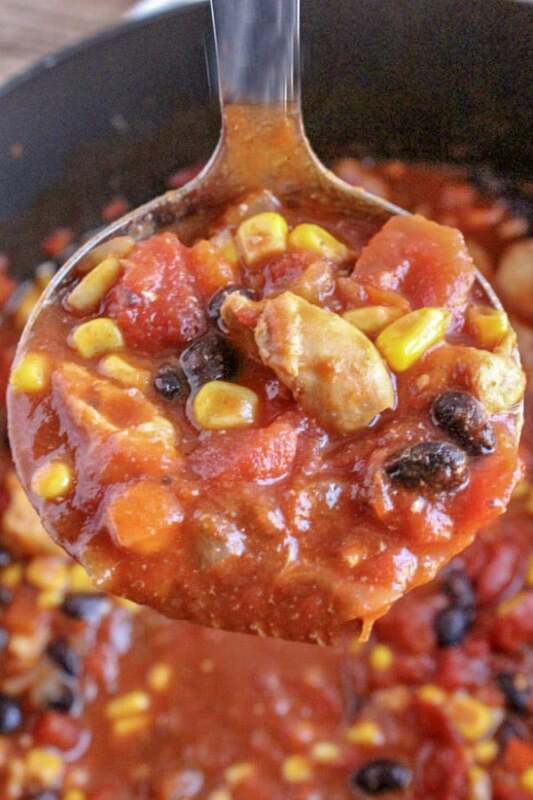 Add chicken, black beans and corn bring to a boil. Cover and reduce heat. Simmer 15 minutes. This recipe can be prepared and frozen for up to three months. I’m crazy about anything Mexican, especially soup. This looks so good on a chilly evening. I love pilling mine up with plain yogurt, avocado and hot sauce! 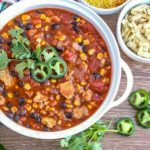 This is a great soup and if you love Mexican food you’ll love this soup! Thanks Beth! This soup is delicious! It is also super easy to make. Oh this looks sooo yummy. It is yummy! I love soups in the fall and winter. This soup is one of our favorites. This soup looks so good, and I just happen to have some leftover roasted chicken in my refrigerator. Guess what I’m making? Thanks for sharing this delicious sounding recipe. I can’t wait to try it. Leftover roasted chicken would be perfect for this recipe. Chicken is such a flexible ingredient. It can be used so many different ways I think that’s why I love to cook with so much. I just love soups at this time of year! I am going to have to try this one – it looks delicious! I love to have soups, stews and chilis for dinner in the cooler months. Of course I’ve been known to make a pot of soup in July just because I was carving it. When you try this recipe come back and let me know if you liked it. Hi Susanne! The recipe sounds delicious! I’ve never had Taco Soup with chicken, but I imagine this would be just like the one with ground beef. Maybe even better! Thanks for sharing! Blessings from Bama! The chicken in the soup is nice because it doesn’t compete with the other flavors. I’ve not made this recipe with beef but I bet it would be delicious. I might have to give it a try. Looks delicious. Pinned! Thanks for sharing with us at #Throwback Thursday link party. Hope to see you again this week. Thanks Quinn! I hope you’ll give it a try sometime. This Chicken Taco Soup is great. Plus it can be made quickly. It’s a great idea for all those busy nights this time of year. Aspen this soup is so easy I thought it would be bland the first time I made it; Thanks goodness it wasn’t. It has become one of my favorite go to meals. Great idea – looks yummy! Visiting from the Wake Up Wednesday hop! Thanks Helen! I love this soup. I hope you’ll try it. It’s yummy and easy. The perfect combination for all those busy nights. That looks so yummy!!! Pinning it to try one night! Thanks Jamie! I hope you love it as much as I do!